10 children share a single textbook and some schools have none. HIGHFIELD, Zimbabwe - Stinking waste flows into the yard from the classroom toilets of B Block. Teachers hold lessons in the shade of trees outside: Much of the schoolroom furniture is piled into heaps of broken wood. Mutasa junior school was once the pride of this teeming impoverished township in western Harare. Now signs in shaky children's writing on the walls tell visitors: "No books, no learning; No table and chair for teacher. Please help." A year after President Robert Mugabe signed a power-sharing deal with former opposition leader Morgan Tsvangirai, making him prime minister, the children at Mutasa school have little to celebrate. "If my parents had money I could go to a better school," writes one child in a poem on the bulletin board who signs himself off as "Sad Boy." Another child says: "Our naked feet are full of blisters." The United Nations children's fund estimates that an average of 10 Zimbabwean children share a single textbook and some schools have no books at all. Almost half of junior school children don't go on to senior school. In one of the biggest donor programs in the last five years, UNICEF and Western donors on Monday unveiled a $70 million program to get children back into class. The program aims to provide a textbook for every child in the country's 5,300 junior schools and will target 700,000 absentee children from the most impoverished and vulnerable communities. Education Minister David Coltart, a former opposition leader, estimates about $1 billion is needed to rebuild and re-equip schools across Zimbabwe. "As shocking as it seems," he said, Mutasa school "is far better off than many." 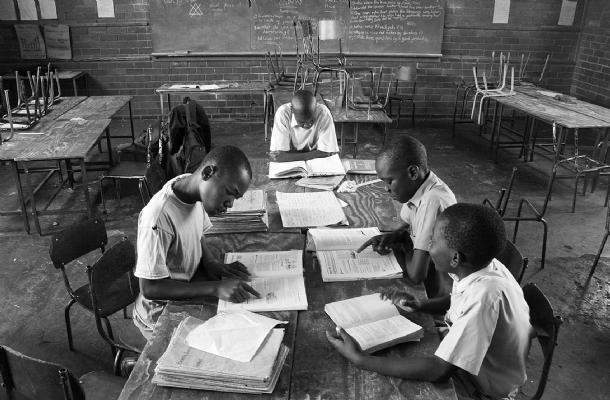 Years of political and economic turmoil brought Zimbabwean education services - once a model in the region - to a near standstill in 2008, depriving millions of children of schooling. Hundreds of rural schools shut down as teachers fled assaults and harassment after the disputed March 2008 presidential election that later led to the power-sharing agreement. Many schools were vandalized and had doors, windows and even roofs stolen, Coltart said. The upcoming rainy season is expected to disrupt teaching outdoors. "We have lost a year. If we don't get adequate resources in a year or two, we will have lost a whole generation. This is the tragedy. Our children should be our absolute priority," Coltart said. Since the coalition government was formed in February after six months of bickering, teachers have staged sporadic strikes over pay. "We don't have the money. The government has a dearth of resources" fueled by international skepticism over the implementation of the deal, Coltart said. Joe Mbadzi, an Highfield councilor for Tsvangirai's Movement for Democratic Change party, said that parents of Mutasa schoolchildren also battled to raise money for fees and top-up "incentives" for teachers. At least 100 pupils dropped out this term. Mugabe blames Western sanctions for Zimbabwe's economic meltdown and insists those measures have blocked national reconstruction. Western nations argue that democratic, constitutional and media reforms promised in the power-sharing agreement have not gone far enough for them to restore traditional ties with the former British colony Mugabe led to independence in 1980. "If we are to restore our once-fine education system, we have to work hard and as a matter of urgency to remove the skepticism," Coltart said. A child's drawing pinned up at Mutasa school shows a teacher with a down-curled mouth and lists payments for food, housing and commuter transport far outstripping his monthly government salary of $150 - the reason given officially for teacher absenteeism. "This is just but unbearable," the grim-faced teacher in the child's drawing says.